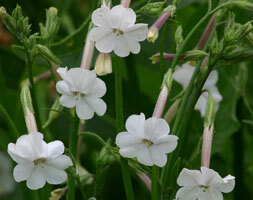 Originating from Australia where it is found growing in open woodland and grassy meadows, this gorgeous tobacco plant is rarely seen here in the UK. It will however make a very graceful addition to the summer garden, providing masses of flowers over a prolonged period. The nodding flowers have a light scent, which becomes more apparent at night.